Swedish Lessons news, Swedish Lessons event! This response is completely insane, but it seems impossible that it was just a year ago when we successfully completed the Kickstarter campaign to fund the book and seven months ago when it launched. It feels like it’s been ages since I was eyebrows deep in the editing and polishing and presenting and promoting of my very first book. Doesn’t it? No? Well, time is a monster that moves differently depending on who is holding its leash, and to me, it seems like we’ve walked to Antarctica and back since Swedish Lessons came into being. Perhaps that’s why, when I suddenly have a day full of book news, it feels like a delightful and startling event. Today, it’s all that times two. 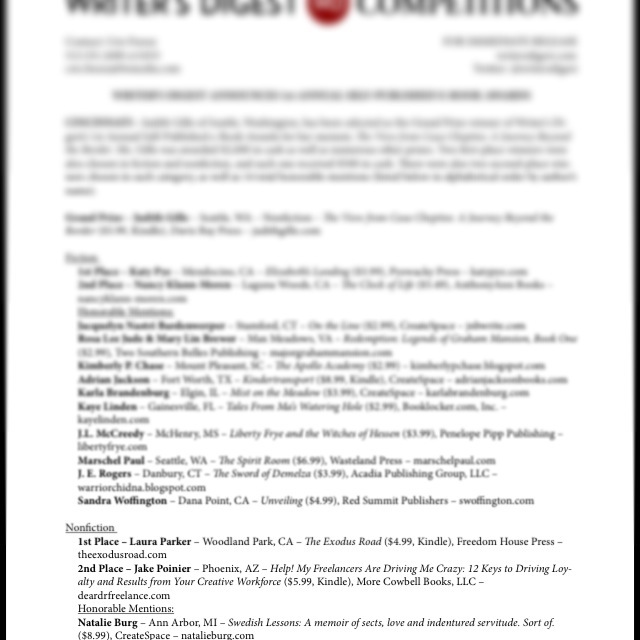 First, I’m absolutely giddy to share that Swedish Lessons was among the 19 books honored in the First Annual Writer’s Digest Self-Published e-Book Awards. Of more than 500 entries, Swedish Lessons was one of four Honorable Mentions in the Nonfiction category. If you’ll notice, my name is first after the 1st and 2nd place lines, which could be because they’re in alphabetical order, but WHO KNOWS?! Gasping for breath from laughing so much. That’s the first reaction to this beautifully rendered, hilarious memoir of time spend in Sweden as an au pair for a startlingly dysfunctional family while recovering from a traumatic breakup. “Swedish Lessons” has everything a memoir needs. It is a truly excellent book. Among the many jobs I had in college was as a barista at Schuler Books’ Chapbook Cafe in Lansing. I really wanted to work in the bookstore, where all the smart and more highly paid employees were, but I never applied. There was a book test! Somehow, despite being an avid reader and English major, I didn’t have the confidence to even try. Tomorrow, I’ll be back at Schuler’s as a panelist for Local Author Night, to talk about my book with two other writers. I don’t even think they know I used to work there (talk about ages ago), but to me, it feels like a triumph. Maybe they’ll let me take the book literacy test for funsies. Aaaanyway, I’ll be at Schuler Books & Music tomorrow, March 12 at 7pm for chatting, questions, giggles and fun. If you’re in the Lansing area, do come!